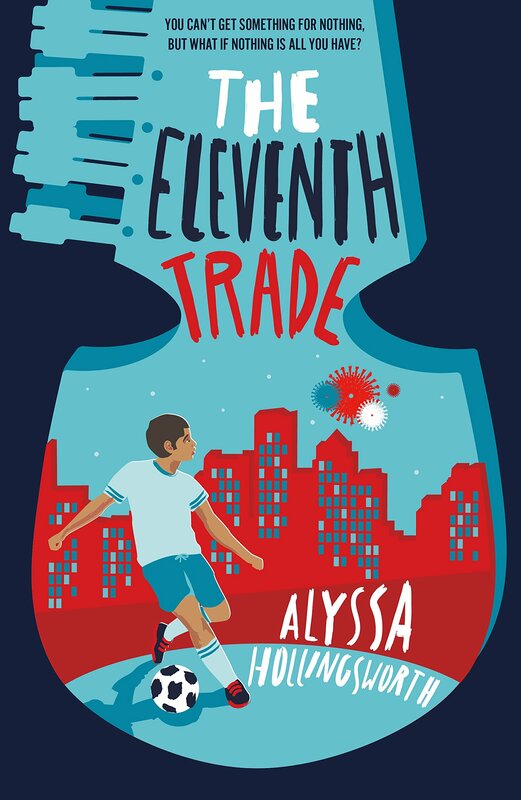 Today, I’m pleased to interview Inked Voices member and author Alyssa Hollingsworth about her debut middle grade book The Eleventh Trade, just released September 18th with Roaring Brook Press. Alyssa talks about her inspiration for the book, what she’s learned along the way, and her process. Welcome, Alyssa! Brooke McIntyre: Congratulations on The Eleventh Trade! We want to hear all about it. What is the story about? 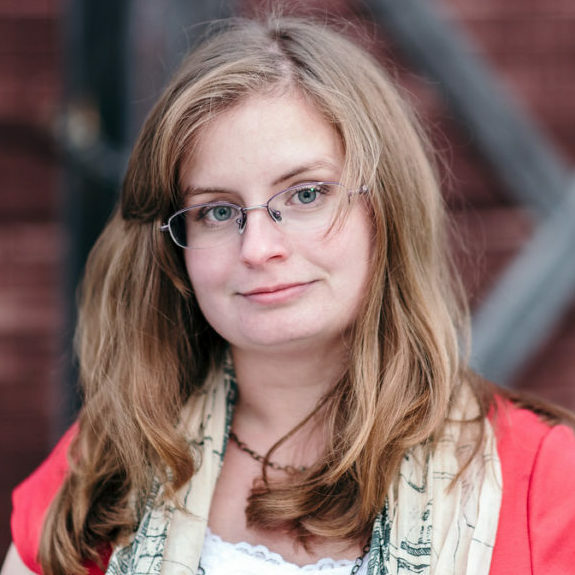 Alyssa Hollingsworth: Thank you! The story is about an Afghan refugee boy recently arrived in Boston who loses his grandfather’s instrument and embarks on a series of trades to get it back. BM: Where did the story idea come from? How did you know it was an idea you wanted to pursue? 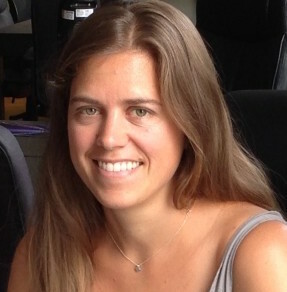 AH: I got my master’s in Writing for Young People from Bath Spa University. While I was in the program, I attended a workshop hosted by author David Almond. During an exercise, the image of a young man playing a mandolin in a subway station popped into my head. Fast-forward. As part of my publishing module (class), to practice my querying skills I had to write a book synopsis and query letter for a hypothetical project that was way out of my comfort zone. Something I would never, ever write in real life. At the time, I was writing young adult fantasy (and I hope to return to that someday). So the farthest thing, I figured, was middle grade contemporary. I remembered that image of a boy playing music in a subway station and decided to run with that. I combined elements of the scene I had written with the basic idea behind Eloise Jarvis McGraw’s The Seventeenth Swap, a book I loved as a kid. I was drawn to the idea of having an Afghan main character by my sister’s extended time living in Afghanistan, and her narrow escape from a terrorist attack right before this assignment was given. All of these threads wove together into a synopsis, which my professor loved. But I tucked it in a drawer and went on with my writerly life. BM: Tell us about your journey in writing the book. What parts did you enjoy best? Did you ever have a “dark night of the soul” in either writing the book, or querying it and then preparing it to go on submission? What are some of your takeaways from the process? AH: After Amber asked me to write a complete draft, I definitely went into a tailspin and minor identity crisis. I had always written YA fantasy and the thought of debuting in MG contemporary was terrifying to me. It was, indeed, way out of my comfort zone. There were also a thousand things about this book that scared me. The obvious things are pretty clear: I’m not an Afghan or a Muslim. But I also did not attend public school, never particularly cared about soccer, had only been to Boston once, had visited Kabul but not Kandahar (my main character’s home in Afghanistan), don’t play any sort of stringed instrument, and am not a boy. So there was a lot that I knew would be hard to write and would take me completely out of myself. But in the course of writing that first draft, I realized how much this story had to teach me. At the same time I was drafting it, I was also (finally) seeking counseling for abuse I experienced as a kid. Before this, I had never realized how much that trauma influenced who I was as a person as a writer. It was so extreme that when I gave my manuscript to Amber, she told me the way I wrote emotions had changed between my fantasy project and this book. My weak points in the story also opened so many doors for experts to come alongside this book. From refugees (both my friends and strangers) to Manchester United mega-fans to pawn shop workers, a community sprang up around me while I wrote. They called me out when I got something wrong, let me know when I was doing it right, and made this book what it is. There were crazy serendipitous moments where I almost felt like a conductor turning individual songs into a symphony. Such a cool and terrifying feeling! I was lucky because I already had Amber when I started this process, and we knew each other pretty well. She’s great at pushing me beyond what I can do on my own and without her passion for this story I don’t know if it would have ever existed. It was January 2016 when she asked me to write the first draft. And it was November 2016 when it went out for submission with publishers. Several publishers were interested. We went to auction. It was nerve-wracking but Amber has nerves of steel. And in the end, I came away with two amazing publishers—Roaring Brook (Macmillan) in the US and Piccadilly Press in the UK! BM: What is your writing process? How do you balance work and writing? AH: I’m a plotter, 100%, all the way, 24/7. I have a very methodical approach to writing. Normally I spend about 1-3 weeks doing extensive work on developing my cast, figuring out character arcs, putting together multiple overall outlines, and then breaking that down into chapter summaries for the entire project. Then I set myself a deadline and try to write every weekday (I normally take weekends off, unless I’m in a crunch). I love using 4theWords to keep my fingers on the keyboard. My day job is at a quiet university, which is enormously wonderful for an introvert like me because it doesn’t drain all my energy. I seem to write best in the morning, though I’ve had to adjust to taking some afternoons and evenings to reach my wordcount goals in a pinch. BM: You have a beautiful new author website and it’s clear that you spent time working to get it just so. Who are your target audiences for your website? Do you have any favorite resources you might share with others planning their author websites? Before I began revamping my website, I hired the lovely Jonelle Jones for help with my personal brand and logo designs. We did a few interviews to narrow in on my audience, which is made up of librarians, teachers, parents, and writers. We wanted to create a “sensible and kind” vibe, and I think Jonelle did a fabulous job with that goal! Over the course of a month, she put together a style sheet for me to use, including extra doodles, some book quotes, and a variety of logo options. Then I went to town obsessively studying ALL the author websites, analyzing what I liked or didn’t like, and creating my own twist. I use the premium theme Highend (I fell in love with it when we dusted off WriteOnCon in 2016). In general, I normally make my theme selection from Themeforest or Mojo Marketplace. Both of these have a ton of options and a huge following, which means lots of helpful reviews. Be sure to research developers carefully to make sure everything’s on the up and up. You want to get a layout that is responsive (that means it will be pretty on mobile or tablets), one that has thorough documentation (that will be your tool for setting it up and troubleshooting customization options), and one that has an active help forum (so you can search for answers to your questions, or ask your own if no one has yet). If you are interested in an exhaustive list of author website tips, I recently posted a blog entry detailing everything I analyzed as I went through author websites. BM: Where can we find you online? AH: You can find me on Twitter, Instagram, or Pinterest!